Dad T-Shirt Discounts Apply ! 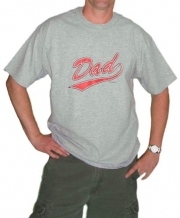 Dad will look great in this clean, classic, traditional baseball inspired design. The 100% cotton tee (gray is 90/10) and professional screen printing will make sure that this shirt will be Dad's favorite for years to come. Perfect for outings, errands, and sitting in the stands as a cheering squad!